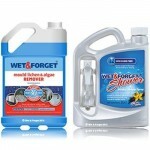 Does Moss, Mould, Lichen or Algae on your patio make your house look unkempt and dirty? Not only can they date a house, but they can also prove to be hazardous when wet by making the surface slippery and dangerous. It’s therefore important to tackle these problems straight away for your own safety. 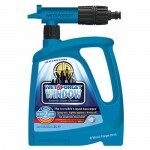 Although it’s often a time-consuming and daunting task, our products can make light work of patio maintenance. 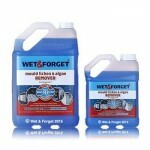 So, here is how Wet & Forget offers the best solution to get rid of Moss, Mould, Lichen or Algae on your patio. Whether your patio contains slabs, concrete or shingles it will be susceptible to moss or algae growth etc. This occurs when water and debris are allowed to sit on the surface for a long period of time and will continue to accumulate over time until it is either removed or has taken over the area. It can be particularly problematic when the patio is in a shaded area. 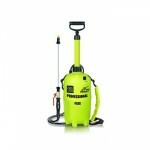 Options for removal include pressure washing, hand washing or harsh chemical products. 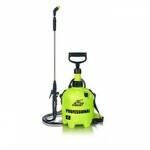 For removing moss or algae, pressure washing is not just a relatively expensive method, like hand washing it can be a time-consuming process. It can also damage your mortar or sand-filled joints with the prolonged pressure needed to dislodge the moss and does’t remove the Lichen. 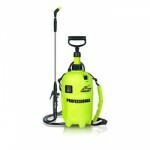 Chemical cleaning products that are caustic, bleach or acid based are often some of the more popular methods for both moss and algae removal. However, these products can cause more problems by damaging your patio than the original moss and algae growth. As they can lead to potential discolouration and harm any surrounding plants, it is best to avoid these products as much as possible. This is where Wet & Forget steps in. 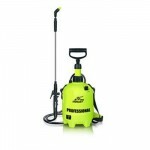 Offering quick and effective cleaning solutions free of bleach as well as being non caustic and non acidic. 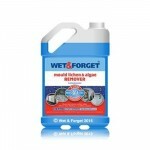 Wet & Forget will get the job done fast. 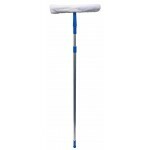 It breaks down the Moss, Mould, Lichen or Algae on your patio over time with the wind and rain after the first use, keeping them at bay for at least a year. Following the first application, any further maintenance will be a much shorter process, meaning you can easily stay on top of your patios cleaning needs. 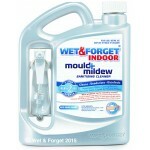 No longer will you be stuck in an endless cycle of cleaning and dismay over your patio, as Wet & Forget actually eliminates the Moss, Mould, Lichen or Algae With the gentle pH of 8, which is as close to neutral as you can get. UK tap water has a PH of between 6.5 and 9.5. You also needn’t worry about the long-term effects on any pets. Just keep them off the treated area until it is dry, subsequent rainfall poses no issues. 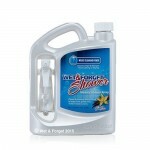 Mix one part of Wet & Forget with five parts of water in a garden sprayer. 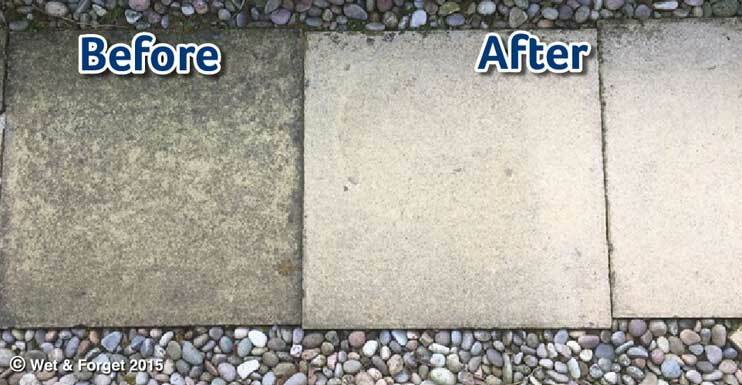 Soak your patio thoroughly with the solution and let it dry for four to five hours - during that time, Wet & Forget starts to get on with the job of cleaning your patio, leaving you free to enjoy the nice weather. And that's it! 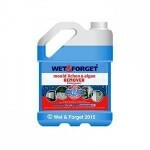 There's no need to scrub or rinse Wet & forget away, simply reapply should Moss, Mould, Lichen or Algae reappear to maintain your beautiful patio. 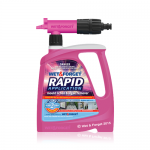 For those wanting to make patio cleaning even easier, try Wet & Forget Rapid. 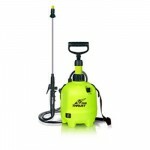 The built-in nozzle and special formula for auto mixing via your hospipe makes treating your patio for Moss, Mould, Lichen or Algae a piece of cake, as you can cover up to 200m2 in just 10 minutes. 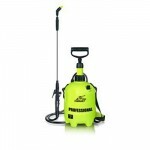 You'll also have the peace of mind of knowing that you've eradicated your problem in the most hassle-free way imaginable.